Hanging baskets are a simple and effective way to brighten up and add colour to any doorway, patio area, office car park or shop entrance. They can enhance the entrance of an office and create a great first impression. A flowering display in front of a house can look inviting. They are also ideal if you are limited with space. OK, so you may not be able to create a display such as the one in the photo! (Well... who knows..!) but if you don't have the time or money to plant out your whole garden, hanging baskets are an effective alternative as they are not so time consuming. With a small degree of effort you can create an eye-catching and colourful display. 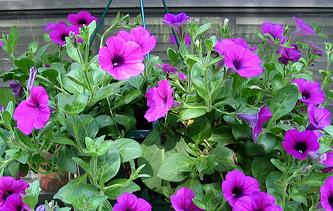 There are three main types of flowering hanging basket: Summer, Winter and Perennial. Ideas for Summer basket flowers: petunias, trailing fuchsias, cordyline for a centre plant, impatiens, begonias and lobelia. Ideas for Winter basket flowers: primula, dwarf conifers for centre plant, pansies, trailing ivy, crocus, cyclamen or winter-flowering heathers. Basket looking like this? Time to give it a fresh lease of life! Firstly, if you have any hanging baskets in your garden already- don't go out and buy new ones..unless they are falling to pieces! With a bit of TLC you can spruce them up to use them again. If you are starting from scratch, visit your local garden centre where there will be a wide range of hanging baskets in different sizes, materials and styles. 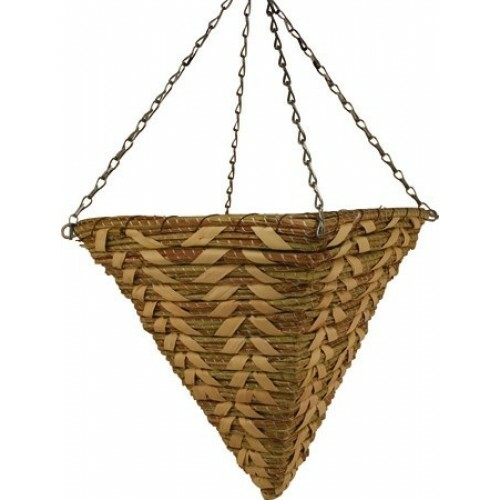 You can get baskets that come with a stand to put on your patio, ones that fix to the wall and others that hang from a bracket. Some hanging baskets come with a lining in such a coco liner. Others, will just be the wire basket and you need to purchase a liner. 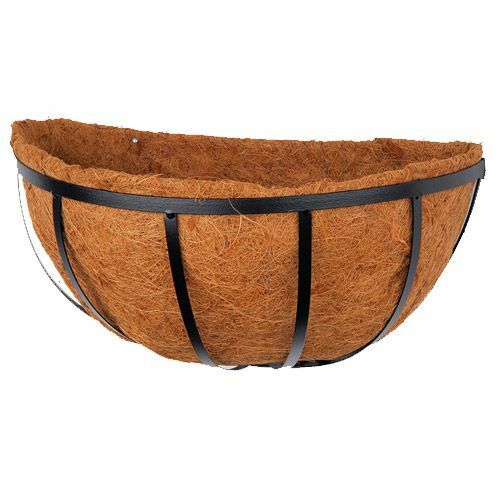 If the hanging basket comes with a plastic lining- be sure to add holes so that the water can drain through - although a plastic liner will not retain water so well, so it will benefit from some fibrous material such as moss or woollen material. For an cheaper alternative buy a wire hanging basket or use one that you already have and then use an old woollen jumper cut up as the lining or use moss from the garden! Mid April to May is the time to plant out your summer hanging baskets as the morning frosts have mostly gone. Plant winter baskets in September and October. 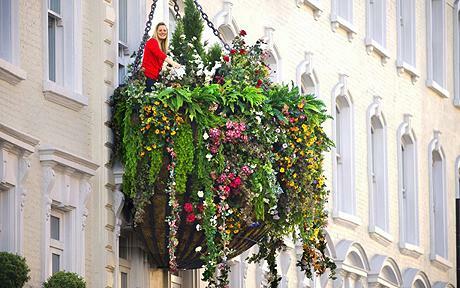 Once you have your hanging basket and it is lined, you need to fill it half full of compost. A good compost to use would be John Innes No 2 potting compost. Although a multi-purpose compost can also be used. You can also add a water retaining gel or granules and mix in a handful of slow release fertiliser granules. First of all think about the colours of the flowers, you may want a colour theme such as blues or whites or you may be opting for a mutli-colour look. It can be a good idea to start with one central plant, we do this for our winter hanging baskets. The central plant will add structure to the basket and looks effective with flowers around it. Any trailing plants that you have chosen such as ivy or fuchsias need to be put at the edge so that they have room to grow over the lip of the basket. If you are using a wire basket with a liner you can also make holes around the bottom and put plants carefully in there. Your local garden centre will stock the plants that are perfect for this season's hanging baskets. When all your plants have been planted make sure they are packed firmly in with more compost and water them well. Hang or fix your hanging basket to a bracket or wall and be sure to place it in a prominent position where others can admire it. Preferably where it will get both sun and shade. Remember to regularly deadhead the plants to encourage more blooms. In Summer watering the baskets regularly in the evening is essential to prevent them drying out and don't forget they will need checking in winter too. Don't drown the flowers, rather the aim is to keep the compost moist. Apply liquid fertiliser through the growing season as per the instructions on the container. The larger the basket, the more compost it can hold - a larger ratio of compost to plants and will retain more water. Watering is key! Do not over water, but water the hanging basket when you feel that the top of the soil is dry. Ensure the water is draining through. Add a slow release fertiliser when planting the flowers in the basket then add a liquid fertiliser through the growing season. Hanging baskets don't have to be just used for flowers and plants. Try using them to grow strawberries, tomatoes or other small veg and fruit.